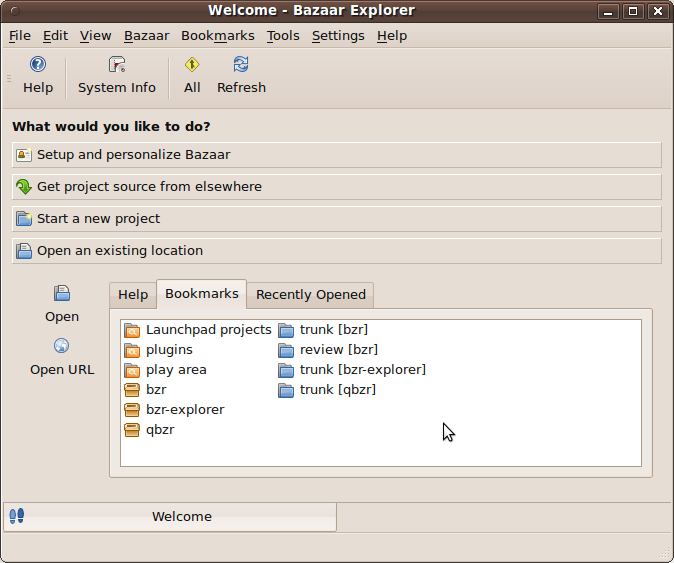 This tour shows Bazaar Explorer running on a Ubuntu (GNOME-based) desktop. If you are using another desktop, you may prefer to take the KDE, Windows or Mac OS X tour. If Explorer is started without an initial location, the Welcome page is opened. There are four panels as shown below. Normally, the welcome page opens to the first panel. If you have bookmarks defined or recently opened locations though, it will open to the last panel and display them. To open a bookmark or recently opened location, double-click it. 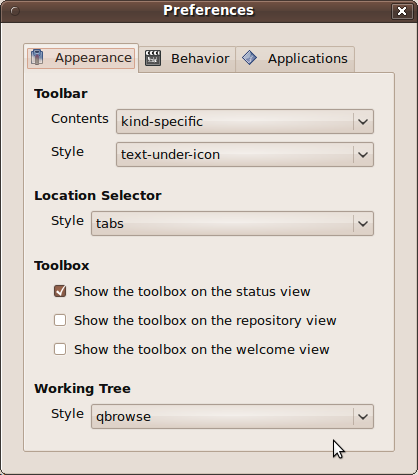 The Preferences action is called Options on Windows: Explorer detects whether it is running on Windows, GNOME, KDE or OS X and adjusts its menus accordingly. 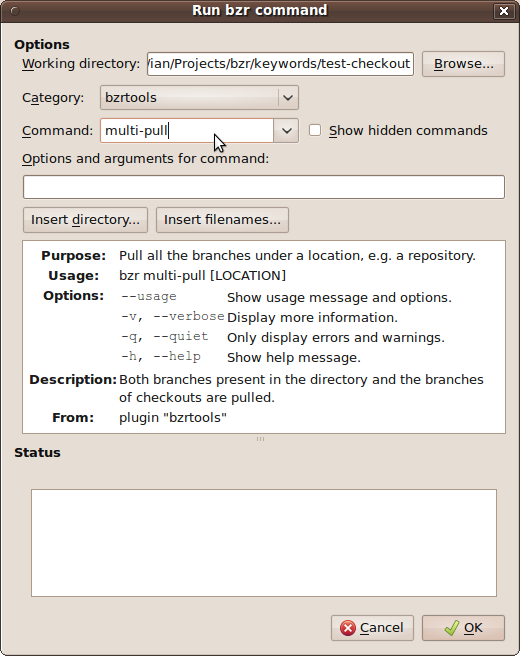 The repository view shows the branches and checkouts inside a repository. It is also used for managing branches. The last 5 revisions are shown in the Recent History tab. To open a branch, double-click on it or select it and select Open. To create a new branch from an existing one, click on the branch to use as the source and select Branch. 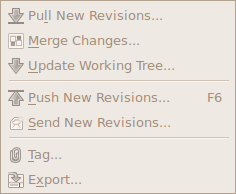 The Local Changes tab shows you whether the working tree has uncommitted changes or not. It also shows you whether a given branch has revisions which are yet to be merged into the parent branch. 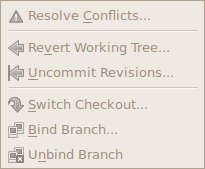 The Missing Revisions tab shows the revisions which are in the parent branch but not this one. The Manage button opens the repository’s root directory in your file manager. This is useful if you wish to rename or delete branches. When you open a branch or checkout, the status view is shown. The left-hand side shows the current status of the working tree. This shows what files have been added, deleted, renamed, modified, etc. It also shows recommended actions to take next. For example, if there are no conflicts and no unversioned files, it will suggest either the Diff or Commit actions. 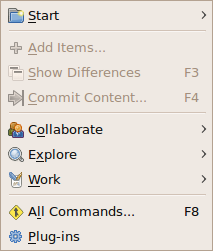 The right-hand side is the toolbox and working tree browser. The toolbox is a configurable collection of useful commands. The working tree browser can be used to navigate and make changes to the current working tree. To open a file using the default application, double-click it. To edit a file, select it and select Edit. If your project has lots of files, you may wish to filter the files and directories displayed. To do this, type a string into the Filter field. Before using Bazaar, take a moment to configure things. 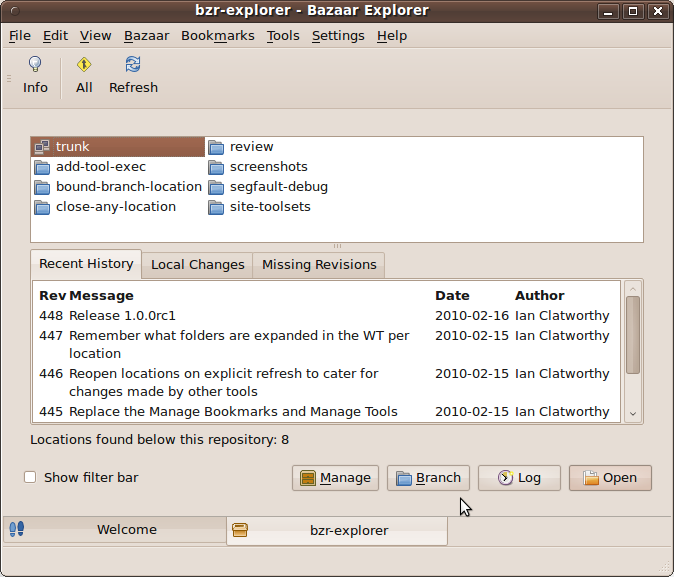 These settings impact both Bazaar Explorer and the command line client (bzr). Configuring your name and email address is important when using a distributed version control system (DVCS) like Bazaar. You may also wish to configure your preferred text editor, etc. These settings only impact Explorer. 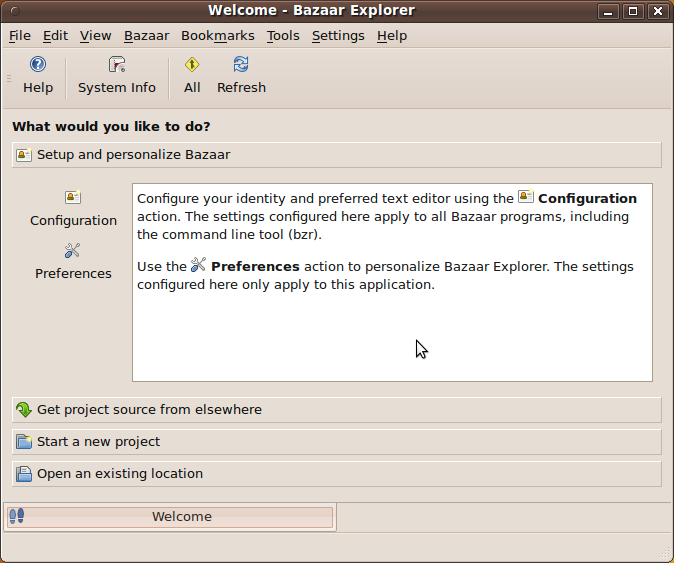 If you wish to use bzr-gtk dialogs with Explorer, select gtk as the application suite. 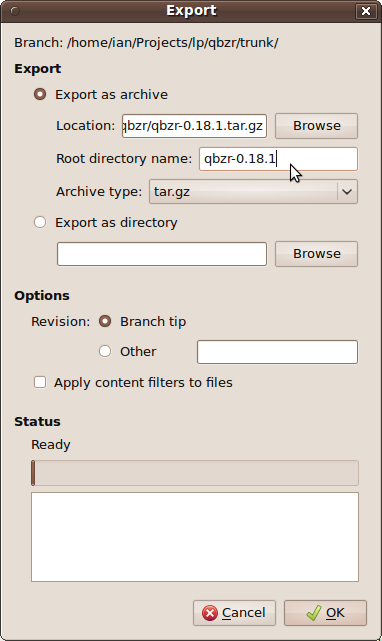 gtk will only appear as an option if you have the bzr-gtk plugin installed. The Start menu is shown below. Start a new project using the Initialize dialog. The tooltips for the various models are given below. Colocated branches Create a working tree at location pointing to a trunk branch in an embedded shared repository. Feature branches Create a shared repository at location then create a trunk branch inside that repository. Plain branch Create a plain branch at location. If inside a shared repository, revisions will be stored there. Otherwise the revisions will be stored in the branch. Shared repository Create a repository at location. 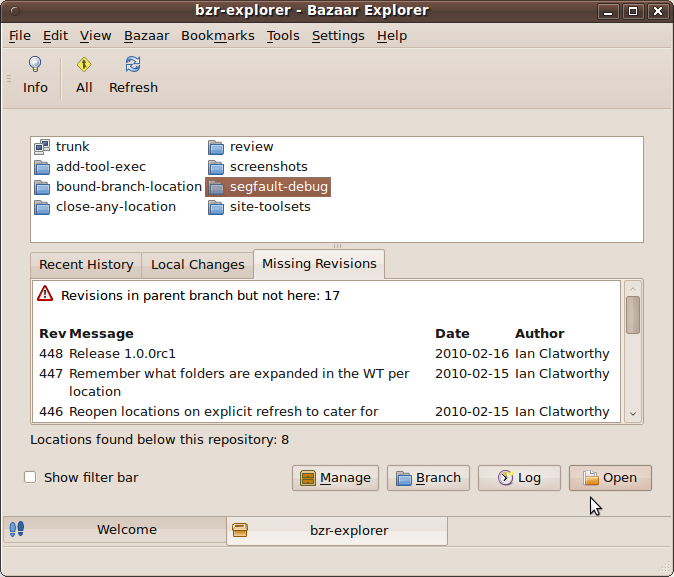 Branches created under the repository will use it for storing revisions. For most small-to-medium sized projects, the feature branches model is recommended. For large projects, the colocated branches model is recommended. 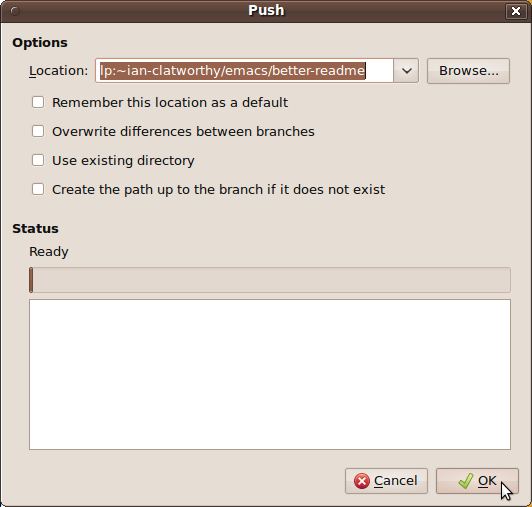 Use the Branch dialog to create a new branch by cloning an existing one. 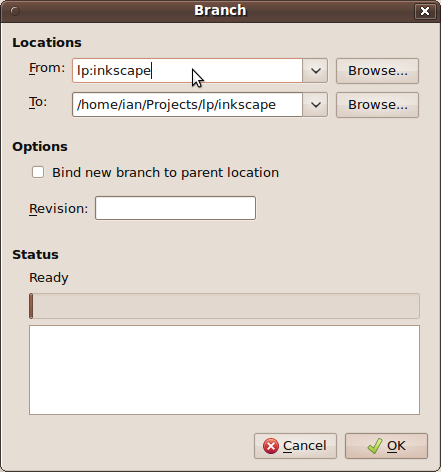 If the destination is outside a shared repository, the Branch dialog will suggest creating one. If you agree, a cut-down version of the Initialize dialog is launched. If you want a working tree in a separate location to a branch, use the Checkout dialog. The Bazaar menu is shown below. 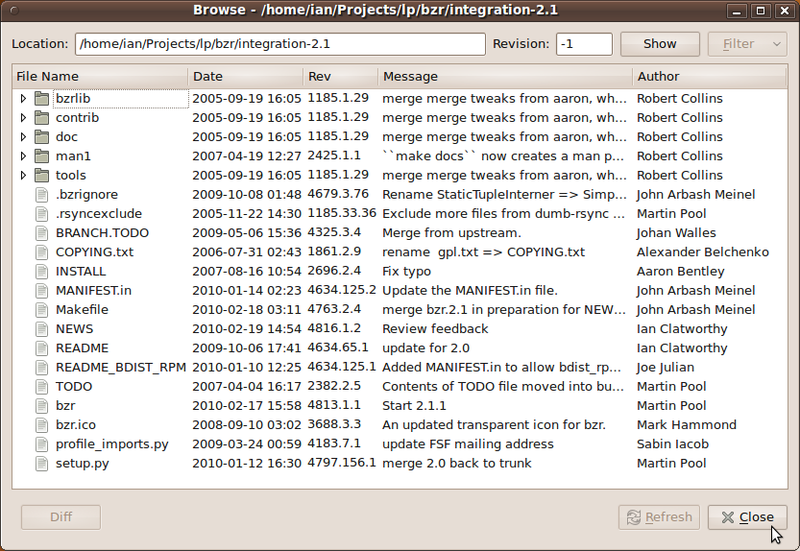 Many of the top-level actions appear on the toolbar. They may also be suggested in the status view if Explorer thinks they are the logical next step. Before Bazaar tracks files, directories and symbolic-links, they need to be explicitly specified using the Add dialog. 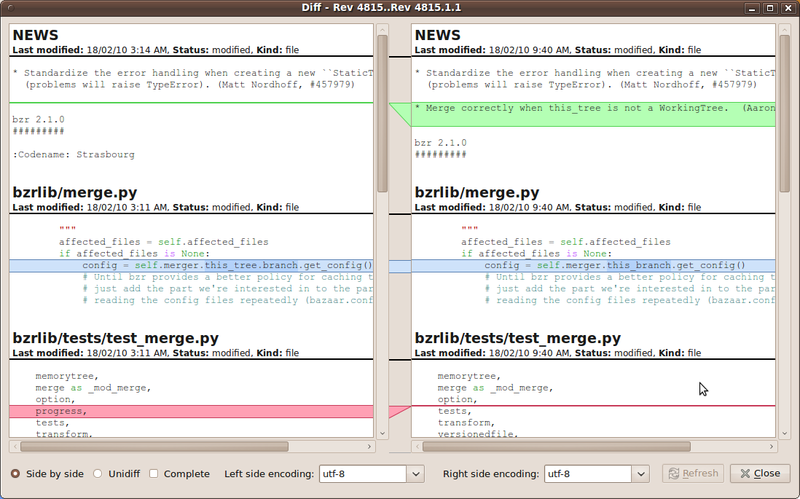 Diff shows what’s changed since the last commit. 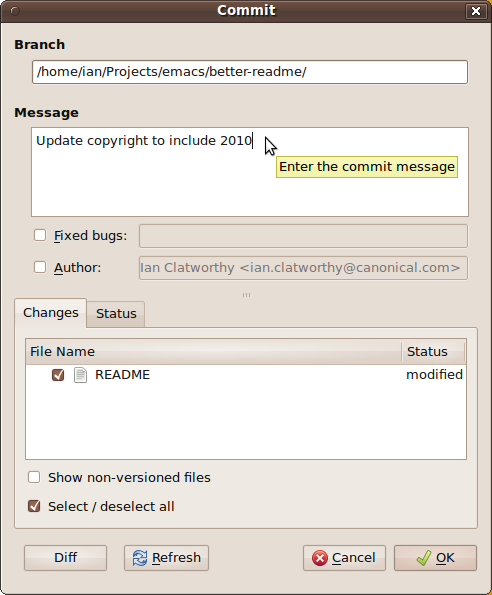 Commit records a new revision. This dialog lets you execute any bzr command. 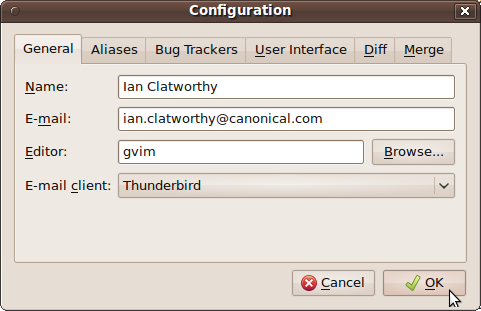 This dialog shows the plugins currently installed and their locations. Some time in the future, this dialog will be extended with plugin management features, e.g. updating a plugin, disable/enable functionality, etc. The Collaborate menu is shown below. These actions help you work with others. To make a branch a mirror of another one, use the Pull dialog. 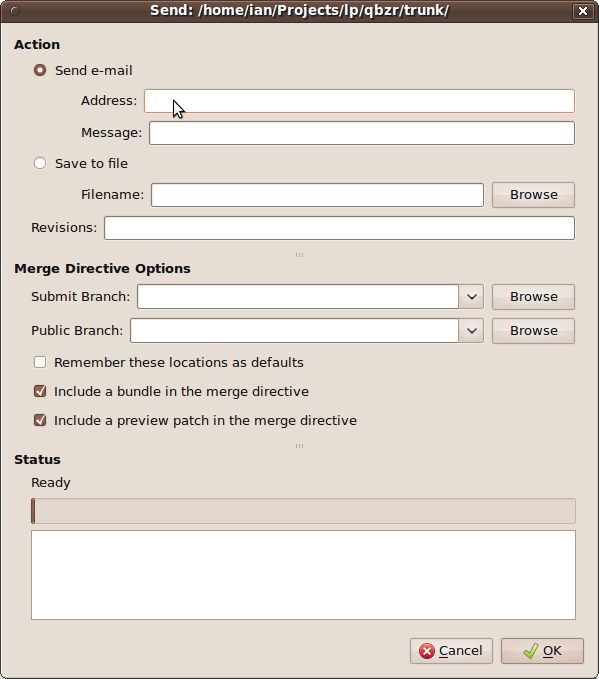 To merge changes made elsewhere into a branch, use the Merge dialog. 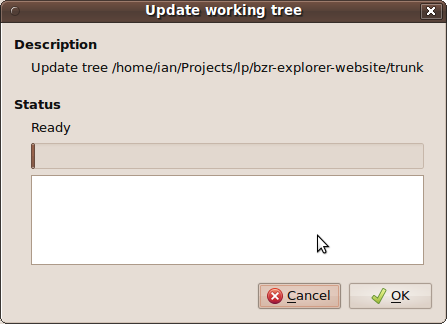 The Update dialog refreshes the working tree with changes made to the branch. Update is a commonly used action on a checkout. After making changes, you may wish to push them to a central location using the Push dialog. After making changes, you may wish to email them to others using the Send dialog. 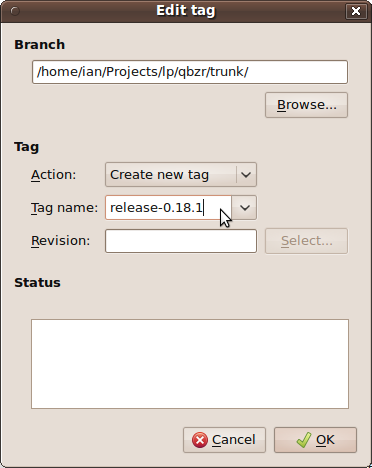 The Tag dialog lets you add, rename and delete tags. The export dialog creates archives of the last revision or an earlier one. This is useful for packaging your project as a zip or tar.gz file, say. The Explore menu is shown below. These actions provide information about the current location and your Bazaar installation. 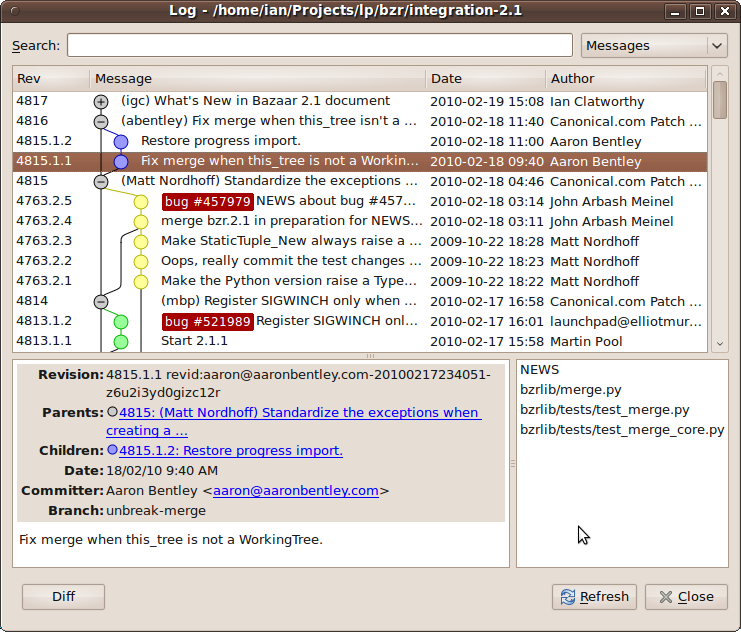 The Log dialog shows the revision graph over time. 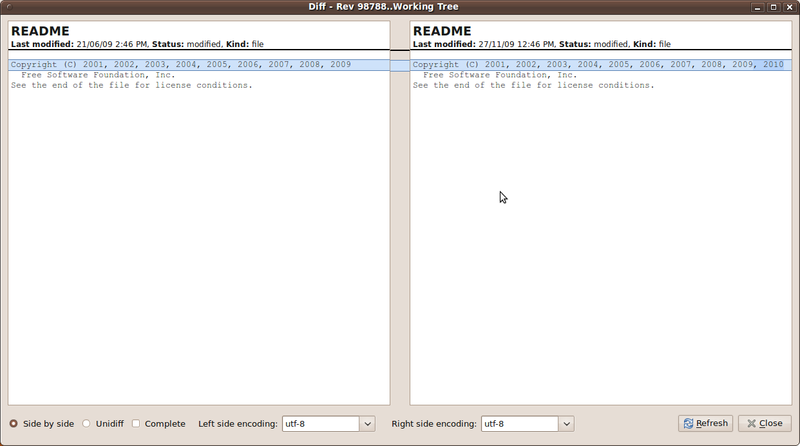 From this dialog, you can double-click on a revision to see the changes made. You can also Annotate a file (see who changed each line and when) from the context (right-click) menu. 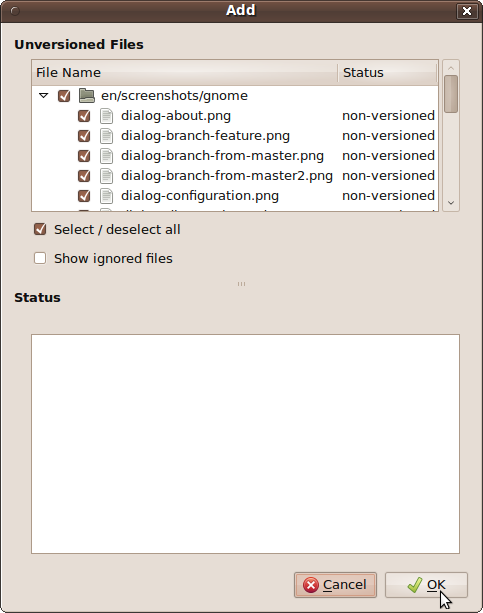 This dialog is also available from the working tree browser in the status view. By default, it shows the status of each file. To see the tree as it was at a given revision, enter the revision identifier into the Revision field. To see the content of a file at that given revision, double-click on it. You can also view the annotations and log history for a given file from the context (right-click) menu. This dialog shows information about the current branch, checkout or repository. 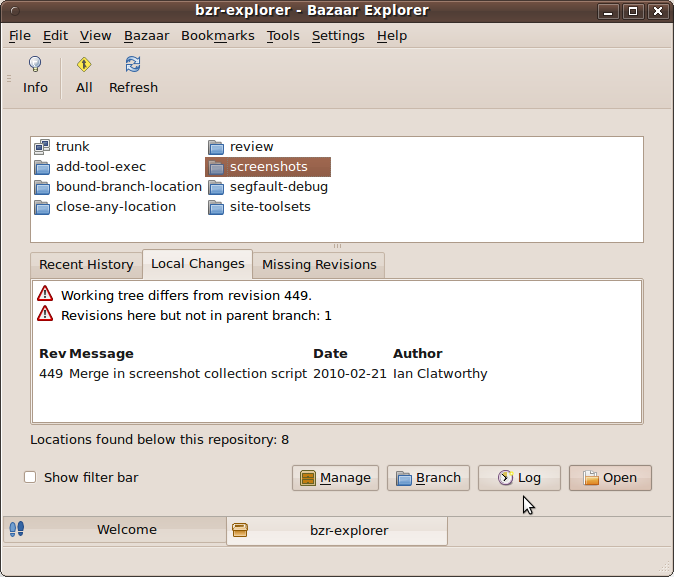 This dialog shows information about how Bazaar is installed. 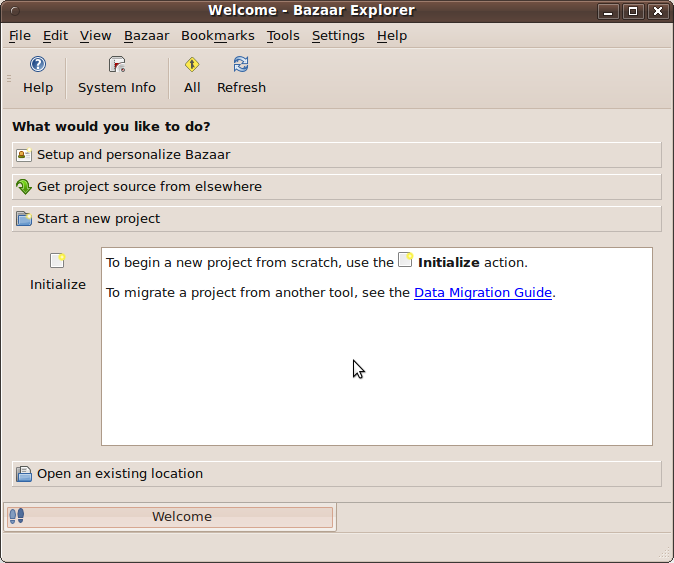 For information about your Bazaar Explorer installation, see Help > About. This displays the bzr.log file. You may be asked to provide information out of this file when troubleshooting problems. The Work menu is shown below. These actions operate on the current tree or branch. 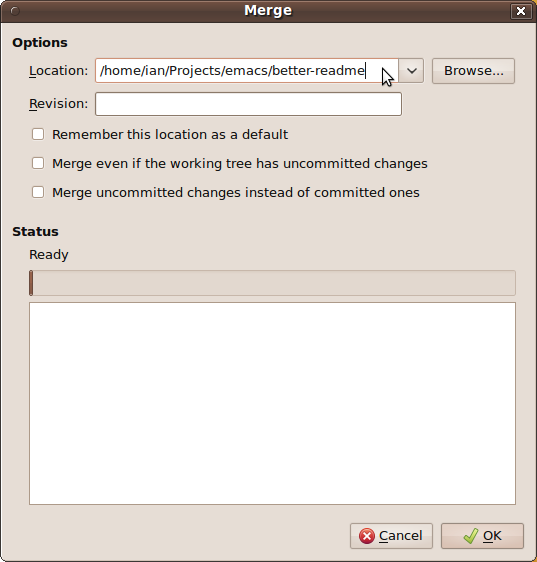 After merging branches, some changes may conflict with each other. The conflicts dialog is used to resolve them. 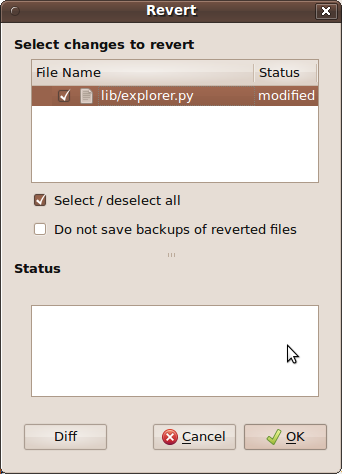 To undo changes to one or more files, use the Revert dialog. 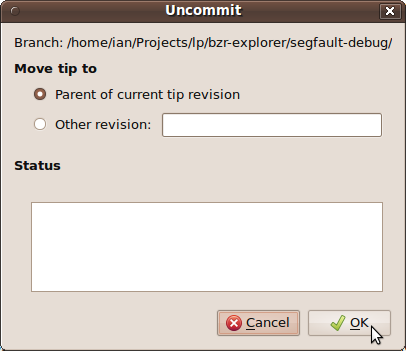 To rollback one of more commits, use the Uncommit dialog. The main reasons for doing this are to correct the commit message or to change the set of files committed. The branch a checkout is pointing to is changed using the switch dialog. 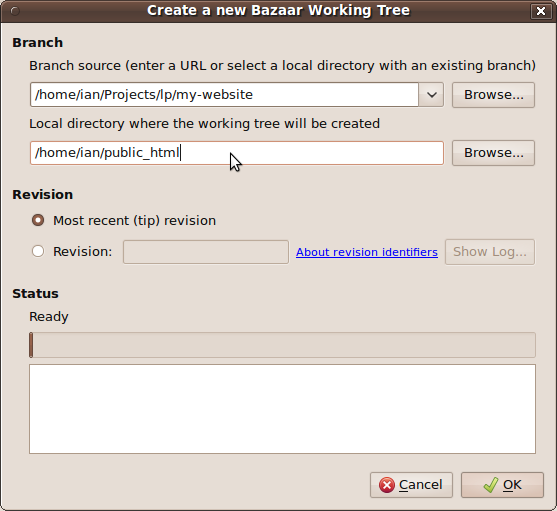 Bazaar lets you bind a local branch to a remote branch so that commits are made to both places at once. 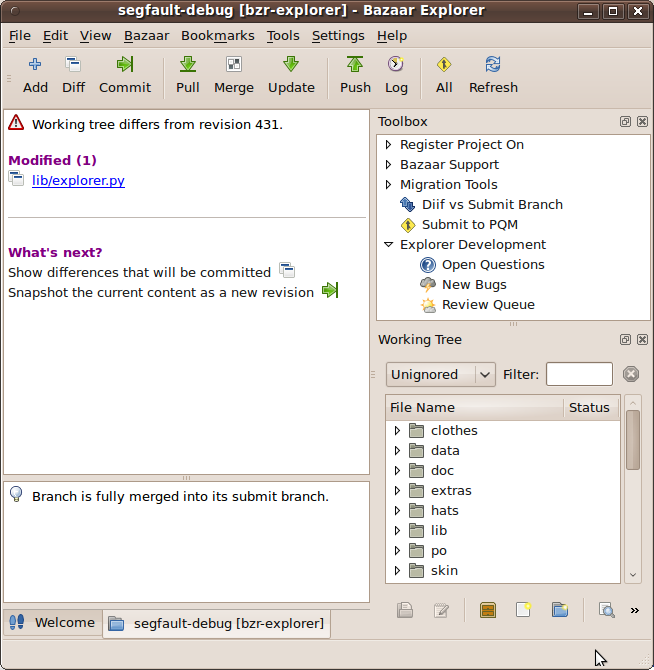 Bound branches implement the commonly-used centralized version control workflow. Bound branches are more intelligent than a post-commit hook that propagates changes. In particular, a commit to a bound branch will only succeed if the local branch is up to date with the remote branch and the commit to the remote branch succeeds. 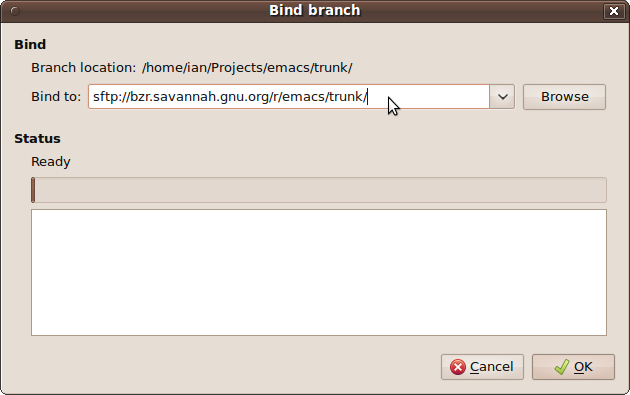 To unbind a bound branch, use the Unbind dialog. We hope you enjoyed the tour above. 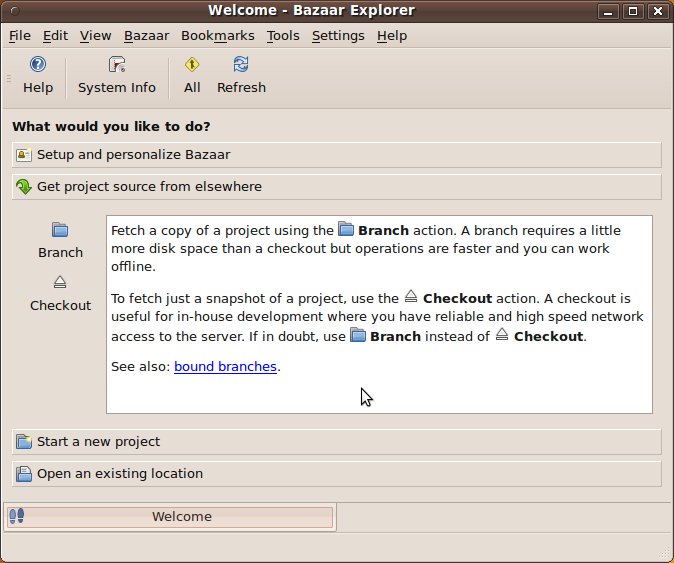 For more information about Bazaar Explorer, see the key features or contact us.